The individual gas molecules are highly unpredictable, but the bulk properties of the gases are nevertheless very predictable thanks to physics. More specifically the laws of thermodynamics and the ideal gas law. The bulk aspects of the gases are a result of the statistical properties of a vast number of particles. Statistics is surprisingly predictable even if the individual cases are not. Just look at Las Vegas and the insurance industry which make a living on the fact that probabilities (statistics) are predictable. Even economists pin their hope on statistics, and the medical sciences would never be where they are now without the predictive power of statistics. A “gas skeptic” would say that you cannot predict the state of the gas because the molecules are unpredictable. This is analogous to saying that climatic states cannot be predicted because the weather is unpredictable (a “climate skeptic”). Climate can be viewed as weather statistics. Early climatological work was dedicated to survey of how the weather statistics varied from place to place and over the seasons. There are clear effects of physical factors (latitude, mountains, distance to the coast) on the statistical character of the weather and the weather statistics (climate). In other words, the statistical properties are a result of the physical processes and conditions present and are readily predicted from e.g. geographical factors, seasonal variations in the solar inclination, the atmospheric composition and the planet’s distance to the Sun. The weather statistics (eg probabilities) are predictable in spite of the chaotic and nonlinear character of weather itself. There are some examples where the question about predicting the exact state is mixed up with the question of predicting the statistical properties of the system, even by people with some experience in climate research. Some of them are useful for further learning, and there is a number of them in a ‘report’ (“Climate models for the layman”) that Judith Curry has written for a British interest group that calls itself “GWPF”. Curry’s report has also been used to back Norwegian contrarians who support the effort of a populist politician to get a seat in the parliament. The analogy to a “gas skeptic” above illustrates why Curry’s claim is misconceived because it is false that the climate models are unfit to make predictions about the future climate just because the atmosphere behaves in a nonlinear fashion due to the Navier-Stokes equations. The Navier-Stokes equations describe the atmospheric flow (winds), but the key equations for climate change involve the laws of thermodynamics and the way the different gases absorb different frequencies in the electromagnetic spectrum. The most important nonlinear component in this respect include scattering processes, phase transitions, and cloud formation. Curry also introduces a potential paradox in her report when she emphasises natural variations. The magnitude of natural temperature variation are regulated by feedback processes and have physical causes. The climate sensitivity also involve such feedback processes. Any feedback process based on temperature will act on both natural and forced changes in the temperature. If such feedbacks result in pronounced natural temperature variations, they also imply that the climate sensitivity is high. Examples of such feedbacks include increased atmospheric humidity and reduced snow/ice cover. Processes involving clouds are more uncertain, but they too are likely to be affected by temperature (convection) and act to modify the climatic response. Natural variations may arise from both variations in the climatic state (eg ENSO, NAO, and PDO) or from external causes, such as changes in the sun and volcanic eruptions. There are also feedbacks relevant to forced variation as well as internal variability which don’t always mean that higher amplitude natural variability necessarily indicates greater climate sensitivity. For example, the fact that there is enhanced variability in the 3-7 year ENSO band is a result of climate dynamics (Bjerkenes feedbacks) resonating with wave propagation timescales. Other examples include distinct oscillatory models of variability with decadal and longer timescales, related also to oceanic Rossby wave propagation and gyre spinup processes, or timescales associated with the AMOC. It is possible to get enhanced variability on those timescales as a result of dynamical mechanisms without needing to appeal to higher climate sensitivity. Nevertheless, the bottom line is that Curry must prove that the feedbacks involved in the natural variations are different to those affecting the climate sensitivity before she can conclude that natural variability dominates over a warming due to increasing greenhouse gases. When Curry believes that the changes in earth’s temperature are due changes in the sun, it is important to keep in mind that the variations in the sun only affect as a small fraction of earth’s energy input. Amplifying feedback processes are needed to explain the magnitude of the observed changes. Curry makes a point of the temperature increase before the 1940s, and that the CO2 concentrations were low then. But she seems to have forgotten that the forcing is proportional to the logarithm of the concentration: the effect of an increase is initially higher with lower concentrations. The changes in the climate before 1940 were a result a combination of factors when there was an increase in the number of sunspots that coincided with increasing CO2-concentrations. It is well-known that the sunspot record suggests an increase up to the 1950, but various solar indicators indicate no long-term trend in the sun since the 1950. Only the increase in the greenhouse gases can explain a forced warming since the 1950s because no other physical forcings exhibit long-term trends since then. Another issue is that early temperature record does not give as complete global data coverage as more recent measurements. The global temperature analysis is based on smaller sample in the early part, for which we expect to see stronger random sampling fluctuations. This is consistent with what Figure 4 in Curry’s report shows. However, she misinterpreted this as being strong natural variability in the early part of the record. Curry also makes the same mistake as John Christy by using the ensemble mean as a yardstick for the models (here): model evaluations must be based on the individual simulations taking into account the spread of the ensemble run. The climate sensitivity is one indicator for the consequences of a global warming which only accounts for the change in temperature, but it is important not to ignore that changes in the global hydrological cycle may also have a severe impact on society. It is possible that a weaker temperature increase is associated with a larger shift in the convective activity and more pronounced changes in the rainfall patterns (Benestad, 2016). I often find it useful to look at the comprehensive picture in science and look for consistencies, both when it comes to physics and the logic. A curious twist in Curry’s report is (a) her claim that climate models have exaggerated climate sensitivity because they did not reproduce the observed warming over the 2000-2015 period and then (b) her emphasis on natural variations having scales of “weeks, years, decades, centuries and millennia”. If the claims hypothetically were correct, then how would she know that the temperature variations over brief intervals are not just a result of the natural variations that she emphasised? We should expect some brief periods with both rapid as well as slow warming (Easterling and Wehner, 2009), and some of the model simulations have indicated a weak warming over the same period. This is explained in the IPCC AR5 (Box 9.2). Another question is whether the warming rate reported by the AR5 was correct, and more recent studies suggest artificially weak warming connected to changing observational networks (Karl et al, 2015). This has been discussed here. Hence, Curry’s claim about slower warming rates has lost substance. The elementary misconceptions revealed by Curry’s “Climate Models for the layman” surprise me. Does she really not understand the flaws presented here or is she trying to sow confusion? The psyche (what goes on inside your head) is subject to forcings as well. Ernest Becker, winner of the Pulitzer Prize for his book “The Denial of Death,” argues that anxiety about one’s mortality is (for the vast majority of people) the psyche’s strongest motivator. It is not that people don’t believe they are going to die, or that they fear death specifically, but that they hope that, somehow, their symbolic immortality will be assured as long as their particular vision of the future of humanity persists. Tell someone that their particular version is doomed, and they will fight you tooth and nail. This comparison to the ideal gas law would be valid if the ideal gas law said something like, if we change the pressure by this amount, hold everything else constant, then it is very likely that the temperature will change by something in the range of 1.5 to 4.5 degrees. Oh, and by very likely, we mean that 5 or 10% of the time, the change will be outside even that range, because you see, there’s this fat tail, ….etc. But no. The ideal gas law gives a specific answer, and repeated tests confirm that accuracy of the predictions within the range of experimental error. Wish climate models performed as well. How on earth did the term “skeptic” make such a rapid transition from scientific badge of honor to four-letter pejorative? My university professors are collectively turning over in their graves. “The best way to predict the future is to create it.”–many, many people, including Peter Drucker and Alan Kay, but almost certainly not Abraham Lincoln. As #1 says, people don’t want to change their world view, especially if it involves huge disruptions to our economy as AGW believers tell us are needed. The economy problem is made even worse when the fragility of the existing economy is taken into consideration. Another thing fueling AGW skeptics is the repeated “adjustments” we see from scientists in their data. Saw a report on this just last week – about the heat going into the oceans, not the atmosphere – if the models were right the first time they’d have shown this. They will tell us the models were wrong, or the data were wrong, and they’ve made adjustments to correct them, etc. This may be a legitimate explanation, but if the models were wrong in the past, that provides ammo to believe they may still be wrong. Even worse, it makes it appear that scientists are “making it up” so the data is more in their favor. Also, the fact that most of them are leftists is not a selling point to those who are more conservative. Scientists recoil and become defensive when they see these things pointed out, but they’re real problems. Statistics relate to what has happened. Probabilities relate to what is yet to happen. In many countries, investment firms soliciting funds are prevented by law from claiming that past performance indicates the future. Your proposal might indicate that closely scrutinising the statistics of a roulette wheel would enable you to make a profit from predicting future results. Not so. I assume you agree. As the IPCC said, predicting future climate states is not possible. #1 – Gordon: In addition to the psychological resistance to a vision of a failed future, there are other psychological barriers to facing climate change. Humans evolved to filter information and focus on near-term dangers, like a lion approaching. There are 6 triggers that get us to focus on a problem: 1. Immediate, 2. Visible, 3. Historical Precedence, 4. Simple Causality, 5. Direct Personal Consequences, and 6. Caused by an Enemy. Until recently, climate change had 0 of 6 (you could now say that it is somewhat visible). Number 6 is an important one… imagine if we found out tomorrow that all the excess CO2 is being released by North Korea in order to destabilize the climate. We would take care of that swiftly! It’s almost as if the climate crisis was designed by a diabolical genius specifically so that we will not respond in time. There are two problem here which are conflated in this post. 1. There is an attractor and the first question is if the attractor is sufficiently regular to be predictable. Aside from trivial very low dimensional systems, there is next to nothing known about this. We do know that there are bifurcation points, where prediction is really essentially impossible. In the steady state case using a turbulence model, multiple solutions are very common, some of which are physical and some of which are not. 2. The second question and a more difficult one perhaps is if discretizations of the continuous problem possess the same regularity (or lack thereof) of the continuous attractor. It is known that discrete systems can have very different “statistics” from the continuous system. There can be strong sensitivity to time step selection for example. Grid convergence might be one way to check this, but is really virtually impossible even for the Navier-Stokes equations. There are some recent results showing a disturbing lack of grid convergence for time accurate Large Eddy Simulations that will appear soon in the public domain. So, these questions are very deep and largely unknown. We have various pseudo-scientific glosses and perhaps Curry falls victim to some of these. But, surely, credibility of GCM’s for long term predictions is really more an act of faith than of any credible theory or computational evidence. My favorite is the “converting an initial value problem into a boundary value problem” which is really just words and a gloss on the real issues. Can you suggest something to read about how modelers are trying to include future changes in the sun and volcanic eruptions? Thanks. Thanks for this. Apart from the helpful rebuttal, I especially appreciated learning to think more carefully about the argument (which I often make) that strong natural temperature variations imply high climate sensitivity. Could you point me to a good up-to-date discussion about attributing the pre-1950s instrumental-era warming? TW 2: e ideal gas law gives a specific answer, and repeated tests confirm that accuracy of the predictions within the range of experimental error. BPL: Well, no, it doesn’t, actually. For that you’d want the van der Waals law or one of the many other approximations worked out for it. The ideal gas law only applies to ideal gases; to actual gases it applies approximately. TW: Wish climate models performed as well. KIA 5: it makes it appear that scientists are “making it up” so the data is more in their favor. BPL: You have to be a science illiterate and a conspiracy-theory nutball to think any such thing. MF 7: Your proposal might indicate that closely scrutinising the statistics of a roulette wheel would enable you to make a profit from predicting future results. Not so. BPL: No, because the wheel is set up so the house always wins in the long run. Which is predictable statistically, even though the results of any given spin are unpredictable. Which is the point. Note that the casino very much makes a profit from predicting future results. D 9: credibility of GCM’s for long term predictions is really more an act of faith than of any credible theory or computational evidence. DA 10: Can you suggest something to read about how modelers are trying to include future changes in the sun and volcanic eruptions? Thanks. BPL: You use past statistics of variation, write a Gaussian random-number generator (or use one somebody else wrote), set it to the same mean and standard deviation, and do a large number of runs. Appreciate the effort Rasmus puts into these posts, and I realize that English may not be his first language, but I’ll be a bit pedantic here and also emphasize that there is a difference between statistics and probability, proper. But my major concern is that when arguing with the likes of Curry and the skeptics (note: yes, that term is now derogatory, due to decades of social warfare over evolution and other science) is that the battle is not really over science at all. Rather, as noted by a few other comments here, the conflict is a social one, religious sometimes, almost always tied to economic implications. Trying to make hay over the random variability in a complex system is simply a way to burn time, becoming the practice of polemics. In the steady state case using a turbulence model, multiple solutions are very common, some of which are physical and some of which are not. But, surely, credibility of GCM’s for long term predictions is really more an act of faith than of any credible theory or computational evidence. Your comment may be reasonable, but it is really a version of strawman, unrealistic expectation (Nirvana), and other similar rhetorical ploys. What do you mean by “predictions”? If we have a number of projections (not predictions) based on the best physical understanding at the time, combined as the author says with a comprehensive overview, why is that not sufficient guidance to determine policy? Do you have an alternative framework of physics to suggest? We can all agree, that climate can be described as statistics of past weather events. Weather is defined as the state of the atmosphere at a particular place and time as regards temperature, cloudiness, precipitation, sunshine, wind, rain, etc. Predicting weather is difficult, especially for the future. As long as the underlying causes are unknown, statistics cannot be extrapolated into the future. There is not just one climate either, because climate is different from region to region. Climate is defined as the average course or condition of the weather at a place usually over a period of years as exhibited by temperature, wind velocity, and precipitation. That’s where statistics come into force. But there is simply no global climate on our planet. Correlation is not causation therefore correlation is not an indicator of things to come, because causes can change. “… the medical sciences would never be where they are now without the predictive power of statistics.” Statistics have no predictive power, not even in medicine. Epidemiology is the perfect example. Statistics (of past events) may be used to derive hypotheses, but they have to be confirmed by experiments and observational evidence. So far for the facts and definitions. An article which purports to scientifically justify predictions on the basis of statistics should refrain from using terms that have nothing to do with neither weather nor climate, such as “skeptics”, “contrarians”, “populist”. And at last, the phrase “Curry’s report has also been used to back Norwegian contrarians who support the effort of a populist politician to get a seat in the parliament.” Refuting Curry’s arguments on the basis of alleged political implications is nothing more than ad hominem. You can do better, I hope. Actually, your roulette wheel is not a counter example but a confirming one. If you observe the roulette wheel (weather) long enough you will never be able to predict the outcome of a particular spin (will it rain today? ), but you will be able to predict that, over time, each number is equally probable (the climate). If you discover, over time, that one,or several, numbers are coming up more often than the others (higher temperature), you will be justified in saying that the wheel is rigged (global warming), and you can call in the fraud squad (climate scientists) to find out how (greenhouse gasses). I reckon I could accurately model the statistical behavior of a fair roulette wheel, it doesn’t mean I can make money by predicting the outcome of individual spins, just as being able to model the statistical behavior of weather means I can tell what the weather will be like on this day next year. When your doctor tells you he cannot give you a prognosis for your tumour based on its rate of progression because that would be a matter of probabilities, you can congratulate yourself on ow smart you are, and not bother seeking a second opinion. The ideal gas law is another non-counter example. The ideal gas law is actually based on statistics as well. When you look at a particular volume of gas, you are observing the statistical behavior of something like 6,022,000,000,000,000,000,000,000 (Avogadro’s number) atoms or molecules. You would be up the creek if you tried to predict the behavior of any particular particle (today’s weather), but if the collective behavior were to change, you would be justified in trying to determine why. Wish the climate scientists had 6,022,000,000,000,000,000,000,000 observations on which to base their models! This must be one of the most effective, informative posts RC ever published — because the *fake skeptics* (a.k.a. deniers) are out in force pushing, not just the usual nonsense, but idiocy beyond the pale. They sure sound convincing to the lay reader, but to me they sound stupider than they usually do, by a surprising margin. You must have touched a nerve. And what would it take to get 6.022×10^24 observations? If you had one station every 1000ft height for every square mile of the earth’s surface, you would have (200 x10^6) x (40) = 8000×10^6 (or 8×10^9) stations. Each stations would be measuring temperature, pressure, insolation (how much sun), the concentration of gasses (carbon dioxide, various nitrogen and sulfur compounds, as well as water vapor), particulates (dust, water droplets (clouds)), and probably a dozen other parameters that might affect the weather. If you made one million observations at every station every day, you would have 8×10^15 observations per day. If you made these observataions every day for a year, you would get 365 x 8×10^15 = 2920×10^15, or about 3×10^18 observations per year. To get 6.022X10^24 observations, you would have to do all these observations for about two million (2×10^6) years. And you still wouldn’t be able to predict, precisely, what the weather would be on any particular day in Poughkipsie. Refuting Curry’s arguments on the basis of alleged political implications is nothing more than ad hominem. You can do better, I hope. Oh, RC has long since done better. That’s why criticizing Curry’s arguments in a political context isn’t ad hominem. They’ve already been examined on their scientific merits and found lacking. You’re late to the conversation, my dear fellow, but “thank you for your concern”. “Climate in a narrow sense is usually defined as the average weather, or more rigorously, as the statistical description in terms of the mean and variability of relevant quantities over a period of time ranging from months to thousands or millions of years. 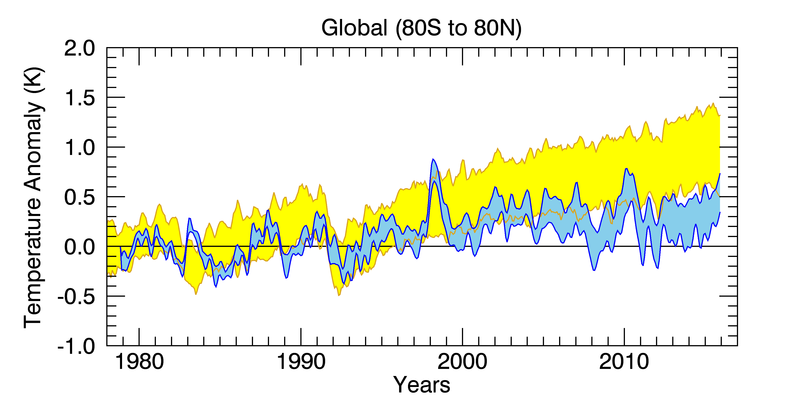 The classical period for averaging these variables is 30 years, as defined by the World Meteorological Organization. The relevant quantities are most often surface variables such as temperature, precipitation and wind. Climate in a wider sense is the state, including a statistical description, of the climate system. In various chapters in this report different averaging periods, such as a period of 20 years, are also used.” – Definition per IPCC AR4. In the context of the OP, “climate” equates to what happens in the troposphere over an extnede period of time. “The climate system is the highly complex system consisting of five major components: the atmosphere, the hydrosphere, the cryosphere, the land surface and the biosphere, and the interactions between them. The climate system evolves in time under the influence of its own internal dynamics and because of external forcings such as volcanic eruptions, solar variations and anthropogenic forcings such as the changing composition of the atmosphere and land use change.” – IPPC AR4. The fact that “climate” and “climate system” have two separate and distinct meanings can cause problems for accurately communicating the science of climate change. The point is not that the climate system is a non linear chaotic system but that it is actually a complex system (in a technical sense) where even things as complex as living creatures are involved. As a consequence there are certainly a lot of emerging phenomena and higher level organization principles at work that definitively cannot be generally predicted from first principles. Il is misleading to invoke the predictability of the properties of things like an ideal or even a real gas at thermodynamic equilibrium. A gas as soon as it is in a state far from equilibrium still contains a huge number of particles yet its behavior cannot be generally predicted from neither from first principles nor even from thermodynamics. The same is patently obvious for a living creature just another system far from thermodynamic equilibrium where ordinary thermodynamics or statistical mechanics or physics is of little help. And the climate system is definitely a system far from thermodynamic equilibrium. Railroad analogy: Pithy award of the month. I hate it when people say stuff better than I did. Amen. It occurs to me to wish that RC could find some sociology-of-the-Internet grad student looking for a thesis topic, who could uses the site track record to figure out which keywords trigger the bot visits and knee-jerk responses from the cut’n’paste brigade. 27 John Hartz says: “separate and distinct meanings can cause problems for accurately communicating the science of climate change. It sure can and does. Jargon is thus “the technical terminology or characteristic idiom of a special activity or group”. Most jargon is technical terminology, involving terms of art or industry terms, with particular meaning within a specific industry. A main driving force in the creation of technical jargon is precision and efficiency of communication when a discussion must easily range from general themes to specific, finely differentiated details without circumlocution. A side effect of this is a higher threshold for comprehensibility, which is usually accepted as a trade-off but is sometimes even used as a means of social exclusion (reinforcing ingroup-outgroup barriers) or social aspiration (when intended as a way of showing off). Circumlocution is locution that circles around a specific idea with multiple words rather than directly evoking it with fewer and apter words. 24 tamino speaks of the coordinated anti-science neoliberal hasbara action teams. 2) especially if it involves [or appears that] huge disruptions to our economy are needed. 3) The economy problem is made even worse when the fragility of the existing economy [and the public’s increasing sense of insecurity] is taken into consideration. 4) Another thing fueling AGW skeptics is the [APPARENT & REPORTEDLY] repeated “adjustments” we see from scientists in their data. 5) about the heat going into the oceans, not the atmosphere – if the models were right the first time [EVERYDAY PEOPLE WOULD EXPECT] they’d have shown this [IN THE BEGINNING]. 6) This may be a legitimate explanation, but if the models were wrong in the past, that provides ammo to believe they may still be wrong. 7) Even worse, it makes it appear that scientists are “making it up” so the data is more in their favor. 8) Also, the fact that most of them are leftists [liberal, social engineers, calling for govt action regulation etc in the USA especially] is not a selling point to those who are more conservative. 10) but they’re real problems. “As the IPCC said, predicting future climate states is not possible.” This seems a reasonable statement to me. This is palpable nonsense, if one accepts the definition “a function of a continuous random variable, whose integral across an interval gives the probability that the value of the variable lies within the same interval.” The IPCC stated that “The climate system is a coupled non-linear chaotic system, . . .” – not even random, let alone a definable variable. As to statements that casino operators can ascertain the future by examining the past, this is likewise nonsense. If the next result of a fair coin toss cannot be predicted in any useful fashion (it should be either a head or a tail, and this is completely independent of past statistics, whatever you might care to believe), then believing that the past influences the future of something as simple as a coin toss seems fraught with danger. As a matter of interest, if the Earth’s surface was molten at on time, it has obviously cooled. In spite of four and a half billion years of sunlight, H2O, CO2, and all the rest. Cooled. BPL: I would hesitate to call a statement from one of the foremost statisticians in the country, if not in the world, “palpable nonsense.” You’re out of your league, Mike. MF: believing that the past influences the future of something as simple as a coin toss seems fraught with danger. BPL: It comes into being ab initio whenever it’s tossed? There are no physical influences? MF: As a matter of interest, if the Earth’s surface was molten at on time, it has obviously cooled. In spite of four and a half billion years of sunlight, H2O, CO2, and all the rest. Cooled. BPL: Yes, over that period, net, it has cooled. Cooled. But now it’s heating. And in the future, it will heat more. In fact, in six billion years or so, the whole thing will melt, and then vaporize. Vaporize. 35 Mike it has obviously cooled. Now what? Was there a point in there somewhere? 1) How can you claim someone using a pseudonym one of the foremost statisticians. The WMO definition – “Climate, sometimes understood as the “average weather,” is defined as the measurement of the mean and variability of relevant quantities of certain variables (such as temperature, precipitation or wind) over a period of time, ranging from months to thousands or millions of years.” The IPCC uses the same definition in its glossary. Tamino’s definition is his own. As I said, climate is the average of weather – that is, the measurement of the mean. No mention of probabilities – a trivial calculation at best. As to a fair coin toss, the probability of a head or a tail is supposed to be equal. Previous tosses have no effect on the next. The probability remains at 0.5. You might think that a run of 20 heads in a row means that a tail is more likely than a head, on the next throw. You would be wrong. The coin has no memory. Examination of past throws tells you nothing about whether the next throw will be a head or a tail. So the Earth cooled for four and a half billion years, but is now heating, you say. Far higher GHG levels in the past didn’t seem to stop the cooling. GHGs warm nothing. The hottest surface temperatures on Earth occur in places with the lowest amounts of that most important GHG (water) in the atmosphere. Coincidentally, so do the coldest terrestrial temperatures. No GHE. None. Try raising the temperature of a thermometer using CO2, if you don’t believe me. Now what? Maybe a continuation of cooling as per the laws of thermodynamics – even Newton’s Law of Cooling shows the principle is fairly old. Or did the laws of physics change in 1750, or 1850 or some unspecified year, and four and a half billion years of cooling halted? The point is that the Earth has demonstrably cooled over the longest period available. No cherry picking. What’s wrong with a very long term average? Mike Flynn @7 & @35. ☻ What is it you refer to when you say “I should have known.”? That you mention it suggests we also should know, but I certainly do not. “☻ Improve methods to quantify uncertainties of climate projections and scenarios, including development and exploration of long-term ensemble simulations using complex models. So, assuming this is the sole source of your IPCC wisdom, it would be prudent of you to read the rest of Chapter 14 and not dwell on a misreading of the Executive Summary. I think you will see that the IPCC is concerned more with identifying and predicting “threasholds” in the climate system, “surprises” as the FAR quaintly calls them. Thus your assertion that “predicting future climate states is not possible.” is a mis-reading of the IPCC and thus quite unsubstantiated. ☻ I fear you also misunderstand the point of predictability within random systems. A random system will still behave in a predictable manner. Even a random walk has specific characteristics. If you are not up to speed on this obvious thruth, a word of advice – stay away from gambling joints. ☻ And climatologically, the matter of interest with the early Earth is less that the early Earth was molten (and thus is cooler today than at the moment of its birth) but that after the various bombardments that caused the geology of the planet to be melted, the temperature did not drop to the point of formimng a frozen surface but somehow maintained liquid surface water at a time when the sun was young and far less powerful. And by the way Mr. Flynn, the physical behavior of a tossed coin (or a dice roll) *also* exhibits dynamical chaos. But you don’t seem to have any problem assigning it a probability mass function — you posit a “fair” coin, which is defined as one for which P(heads) = P(tails). Some define climate as “average weather,” along the lines of Andrew John Herbertson’s statement that “Climate is what on an average we may expect, weather is what we actually get” (he was the first professor of geography at Oxford University). Others refer to it as the “mean and variation of weather” to emphasize that we need to know not just what the average is, but how it might deviate from that average (Herbertson himself included that in a fuller definition). Not everyone grasps what “variation” refers to in this definition. It’s not just the variance, or skewness or kurtosis, or any summary statistics of variation, which is why I emphasize that climate is the probability density function of weather. Some people don’t want folks to understand this, because they want to keep tweeting about how we had some cold weather so global warming must be a hoax. Like Donald Trump. In discussions with “gas sceptics” I’ve often used a similar analogy. We may not be able to predict the course or fate of each drop of water in a river but we sure can predict where that river is flowing. There must be many such analogies which can illustrate the difference between small scale prediction which is subject to high levels of chaotic behaviour versus the large scale behaviour of systems which can often be understood and predicted statistically. Climate Policy is the integral of the publicity density function of climate activism. For the last generation we have been in the processs of finding out what happens when some people focus on the one in the service of the other. KW 38: How can you claim someone using a pseudonym one of the foremost statisticians. BPL: Because I know who it is, duh. MF 39: GHGs warm nothing. BPL: Really? So 200 years of relevant science is all wrong? Tell me, Mike, what determines the surface temperature of a planet? Do you know? MF: Try raising the temperature of a thermometer using CO2, if you don’t believe me. BPL: It’s a standard experiment. You shine a sunlamp on one box with regular air, one with pure CO2, each with a thermometer in it. It goes higher in the one with the CO2. MF 40: The point is that the Earth has demonstrably cooled over the longest period available. No cherry picking. What’s wrong with a very long term average? BPL: It ignores behavior in between, that’s what. Earth was very, very hot for a fairly short period, geologically speaking, when it had a magma ocean and a steam atmosphere. That didn’t last. It cooled dramatically by 50-100 million years after formation. After that it was pretty hot, until the Great Oxygenation Event of the Huronian (2.4 billion years ago or so), at which time Earth nearly froze over. After that it got quite a bit warmer. Similar “Snowball Earth” episodes happened 800 and 600 million years ago. Different processes affect climate at different time scales. The main reason Earth was usually cooling over geological time is because its greenhouse gas inventory has been declining. Sunlight has been increasing! All the stellar evolution models agree the Sun was about 70-72% as bright 4.5 billion years ago as it is now. In 5.5 billion years it will be about twice as bright, and shorter after that it will become a red giant. Good luck keeping the Earth cool then. Beyond including the nominal 11 year solar sun spot cycle, which is included in climate models because it is more or less predictable, how exactly would you expect climate modelers to divine the timing of future changes in solar irradiance and large volcanic eruptions which are both independent of the climate system? That said, many climate models do include arbitrary random eruptions on the expectation that one is probable to occur sometime during a typical model run. I should have known that GHE believers avoid addressing the subject at all costs. If you are claiming the IPCC’s statement that “predicting future climate states is not possible” is erroneous, you might care to advise the IPCC to that effect. I made no assertion in that regard – I merely agreed with the IPCC written assertion. I note that you are not disagreeing with the quote. Trying to explain it out of existence by directing attention elsewhere doesnt seem like a fruitful endeavour. What you fear is of little concern to me. Avoiding discussing chaotic systems is your choice. The IPCC states that that the “climate system” is chaotic. Some years ago, Gavin Schmidt said that he had seen nothing to convince him that this was true. Maybe he still believes that the IPCC is wrong. Chaos is not what many mathematicians and scientists appear to think it is. From Wolfram – ““Chaos” is a tricky thing to define. In fact, it is much easier to list properties that a system described as “chaotic” has rather than to give a precise definition of chaos.” I agree. You might care to explain the specific characteristics of a random walk in terms of chaos if you choose. I wish you luck. I note you claim that the Earth was rendered molten from a colder initial state by various bombardments, and that it has cooled since. I believe that the Earth has a molten core, and that the Earth was molten throughout at its creation. In any case, we agree that the surface has demonstrably cooled. Maybe, like Fourier, Tyndall, Lord Kelvin, and others, you are unaware of the heat generated within the Earth by radioactive mass conversion, which resulted in wildly inaccurate estimates of the age of the Earth based on measured heat loss. According to geophysicists, the Earth is cooling at a rate of around 1 to 3 millionths of a Kelvin per annum. Measurements show the Earth has an effective surface temperature of some 30 – 40 K, in the absence of outside energy sources. GHE supporters overlook the fact that the Earth is more than 99% molten, and thus has a surface temperature greater then zero.